You can declare variable by using the keyword Dim. The first character must always be alphabetic. You cannot use spaces or periods. Variable names can use alphabetical characters, number and some punctuation characters but not ( * . , # $ % & !). The use of the underscore character is also encouraged. The name must start with a letter and can have a maximum of 254 characters. Variable names can be constructed from letters and numbers and the underscore character. Variable names are not case sensitive and by default the interpreter adjusts the names of all variables with the same letters so that their case matches the case in the variable declaration (i.e. when using Dim). If the variable was not declared using Dim then the case matches that of the most recently typed variable. 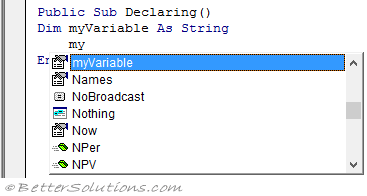 Once a variable has been declared it can be seen in the intellisense drop-down list. Alternatively you can start typing and press (Ctrl + Space) to auto complete. Variable names cannot be the same as VBA keywords. VBA has a large number of "reserved words" that cannot be used for variable names. Some examples of these are words such as "Sub", "Function", "Array", "Integer", etc. If you try to use a reserved word for a variable a compile error will be generated. It is always a good idea to type VBA keywords in lower case and then wait for them to automatically change. It is generally good programming practice to put all your declarations at the very top of a subroutine as it improves readability and makes housekeeping a lot easier. You can actually put your variable declarations anywhere in the code although it is good practice to put them at the start of a subroutine.